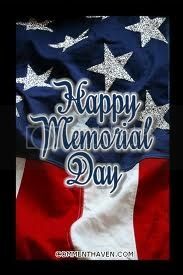 Hi and Happy Memorial Day! A big Thank You to all the men and women within every branch of the armed forces. Thank You for protecting everyone in this country to everyone abroad. This isnt about one day a year. We must remember everyday, when they are home, injured and can nk longer care for themselves, we must care for and protect them. Starting today, it will be..
and the the rest if the week it will be..
You've got some good ones coming this week.